Sailcone’s Grizzly Bear Lodge is on Minstrel Island, on the edge of Knight Inlet. Not only does it have a colourful history but it is located perfectly for wildlife viewing – in the middle between the Grizzly river, our wild river and Johnstone Straits where the whales reside. Our lodge is accessible only by float plane or boat. We fly all of our guests in from Campbell River by float plane. It is a short (half hour) flight with some great views along the way. Campbell River is situated on Vancouver Island and accessible via car [ferry involved] or air [Pacific Coastal Air or Central Mountain Air]. It is from here that you fly to our lodge. For guests driving to Campbell River approximate drive times are as follows. Victoria – Campbell River 3 hrs. Nanaimo (ferry from Vancouver) – Campbell River 1 hrs. Port Hardy – Campbell River hrs. 2 hrs. 55 min. On the last day of your wildlife adventure flights from the lodge arrive in Campbell River at approximately 4:30 PM. We provide hotel accommodation in Campbell River that night at either the Anchor Inn or Painters Lodge ($40 surcharge per person for Painters Lodge). For guests travelling to Campbell River the following links may be of help. Minstrel Island, where our lodge is located, is a small island on the edge of Knight Inlet. Not only does it have a colourful history but it is located perfectly for wildlife viewing – in the middle between the Grizzly river, our wild river and Johnstone Strait where the whales reside. 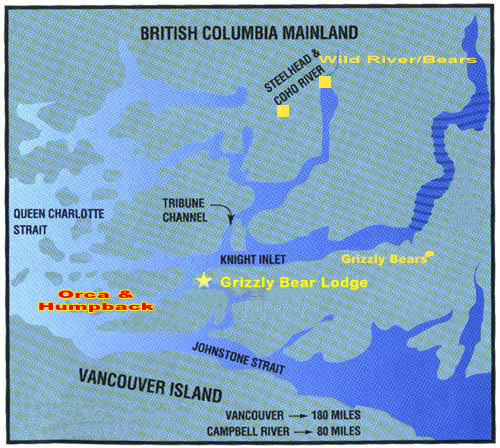 Our guests access the lodge via float plane from Campbell River. It is a scenic half hour flight from Campbell River to our lodge on Minstrel Island. Flights leave from Coril Air in Campbell River (also (see our Arrivals page.). Guests who select a 4 Day or more, their trip will have one day exploring this magnificent river. 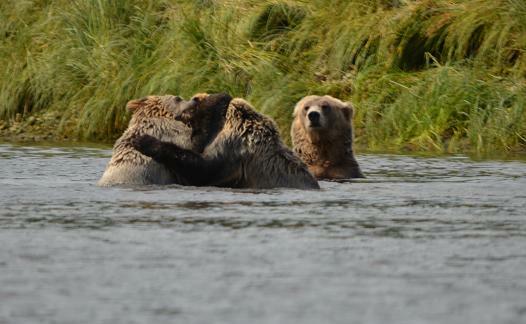 In the later summer and autumn it pairs with spawning salmon which attract the eagles, black and grizzly bears. Beginning your day with breakfast and coffee at the lodge. You then head on a forty five minute scenic boat ride to the river, keeping your eyes open for black bear and dolphins on the way. 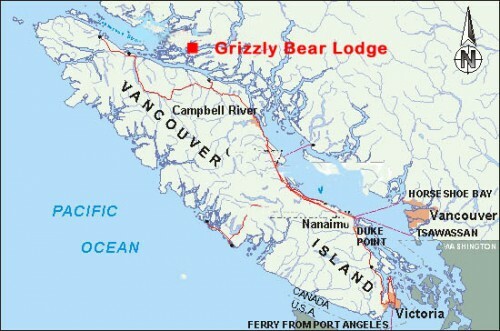 Upon arriving at the river we scan the estuary area for any sign of grizzly bear then load into Trapper Rick’s truck. Using old logging roads we access various areas of the river looking for grizzly and black bear and if so inclined some fishing. Picnic lunch is packed for us and we often eat at Rick’s small cabin overlooking the river and the falls. After lunch some more exploring or fishing then back to the lodge for a hearty dinner. River trips involve some light walking over wilderness terrain. Grizzly bear cubs are still a challenge even when they are two years old. In this case mother is in the background while the cubs play fight in the foreground. It is not always a spectator sport as allot of the time the mother grizzly is in the middle of the fight with the cubs, that is how they learn. Some days in the spring on the river it seems that the bears spend more time fighting than searching for and eating food.